Mumbai Suburban Railway has been built to serve the commuters of Mumbai Metropolitan Region which consists of seven municipal corporations and fifteen smaller municipal councils. Mumbai Suburban Railway comprises of rapid transit system (metro / subway / underground) which serves central urban areas and commuter rail which serves the outer suburbs of Mumbai. It is spread over 555 km, operates more than 2800 train services and carries more than 8 million commuters daily. This makes the Mumbai Suburban Railway the busiest rapid transit system in the world. Train services start at 4:00 a.m. in the night and continue till 1:00 a.m. the next night. Some trains even run up to 2:30 a.m.
To book Mumbai Suburban Season Ticket (MSST) through internet, the users should be registered with IRCTC. If you are not registered, please visit IRCTC website. 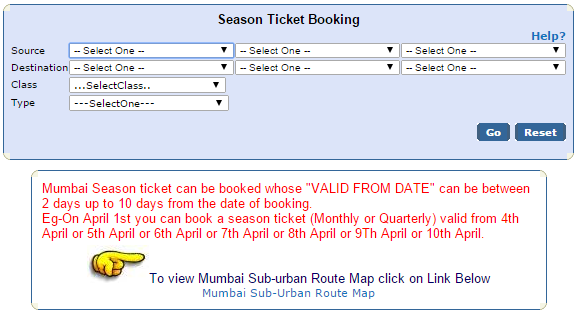 The same registration can be used for booking normal tickets as well as Mumbai Season Ticket. To login to your account, please click here. A part of the screen which follows is shown below. 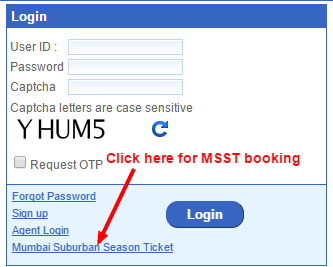 After you click on "Mumbai Suburban Season ticket", the screen that follows takes you to the login page. Enter you login ID and password. A part of the screen that follows after login is shown below. While booking MSST, please keep in mind the following points. In certain specific cases, one can enter maximum of three different source and destination stations, as shown in above diagram. All the valid routes will be generated between these stations and you have to select one route which is best for you. Please note that no concessions will be given for season tickets booked through Internet. Select Class (First / Second) and Type (Monthly / Quarterly) of ticket. After clicking "Go", a new screen appears where you have to enter passenger's name, photo ID card number issued by railway, valid from date, address and phone number. MSST will be sent at the address entered by the customer as there is no provision to collect it personally. After you press "Go", ticket details are shown in the next window, along with "Make Payment" button. After you click "Make Payment", a list of payment options is displayed. Select any one option and make payment. After payment, a confirmation screen will show the details of the booked season ticket. From the same screen, you can book another ticket. Note down the transaction ID and STR number for future reference. Ticket will be shipped at the address entered by you. This delivery of season Tickets through courier is limited to the places like Mumbai, Nashik, Pune, Surat and Thane. No concession is allowed for season tickets. You cannot cancel a booked season ticket. Modifications in season ticket is not possible. Registered users will be able to purchase a season ticket from 2 days up to 10 days in advance from the date of travel. ICICI Bank Payment Gateway: Payments through any Master / Visa credit cards issued by any bank with Transaction charges of 1.8% levied by the card issuing bank. Citibank Payment Gateway: ALL MASTER / VISA/ DINERS CLUB CREDIT CARDS. Amex Bank Payment Gateway: Transaction Charges of 1.8% on the total transaction value will be levied for Cards issued by American Express Bank. Transaction charges for American Express Cards issued by any other bank (eg. ICICI Bank) will be as applied by the issuing bank. ICICI Bank - Transaction Charges of Rs.10/- + service tax and education cess as applicable. HDFC Bank - Transaction charges of Rs. 11.03/- per transaction. IDBI Bank - Transaction charges of Rs. 10/- per transaction. ITZ Cash Direct Debit - Transaction charges of 1.5%. For further details about Mumbai Suburban Season Ticket (MSST) booking, please email IRCTC at seasontickets@irctc.co.in or call Mumbai office at 022- 22625184 / 22625185, and Delhi office at 011 – 23345500 / 23344787 / 39340000.